What do you look for in a webhost provider? Aside from the usual features such as high uptime reliability and unlimited storage, most potential clients look for cheap hosting solutions. Affordable hosting packages may save them a lot of money, but not all of these plans are created equal. Hence, if you are currently looking for a hosting service that is not only suitable on the budget but also in terms of quality, then you should check out InterServer.net. InterServer.net falls in the more affordable line of webhosting solutions, but that doesn’t mean its services are already below par. This hosting service company has been in the market for a number of years already, and its main clients include bloggers, small scale online entrepreneurs, and companies that are after consistent online visibility. 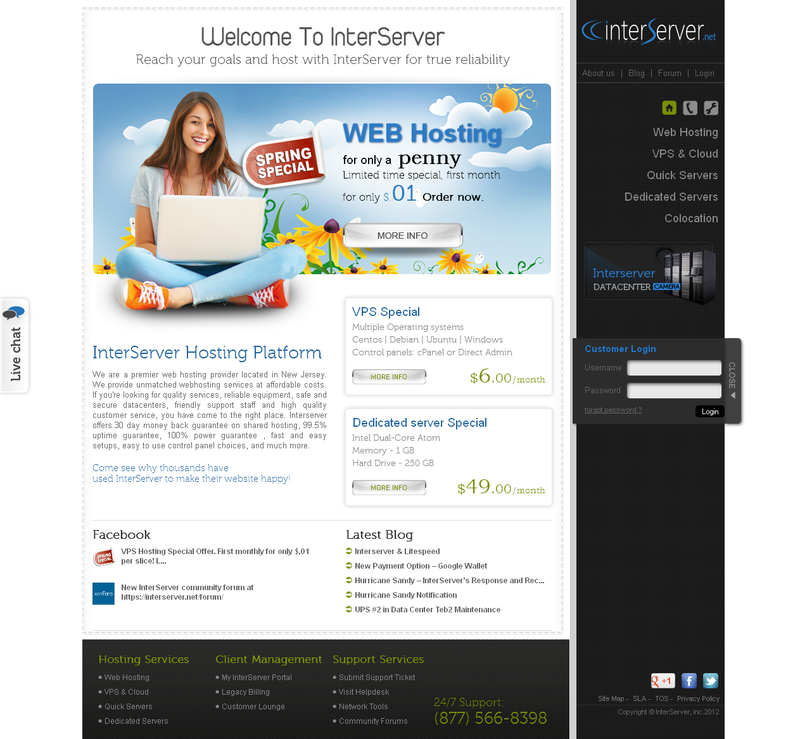 Interserver.net is a webhost service provider situated in New Jersey. It rose to prominence for being an affordable yet at the same time reliable hosting service in the United States, and now it caters to clients from all over the world. •	Easy to use control panel. Interserver.net makes use of the most popular webhost control panel, cPanel. In this control panel, users can easily find the tools they’d like to use in order to manage and improve their websites without the hassle. •	Easy site builder. Another useful tool present in the packages of InterServer.net is the website builder. It offers a website building app that’s offers a drag and drop feature, and doesn’t take a long time to master. New users can even play with it for a time before actually using its functions to build a website of their liking. •	Quality network. InterServer.net makes it a point to upgrade its servers on a regular basis, thus ensuring quality network service to its clients. With a consistent speed with minimal downtime, clients and their target visitors are able to enjoy better access and loading of their sites. •	MySQL on Solid State Devices. InterServer.net offers MySQL for its site database, which can be easily installed on cPanel. •	CentOS operating system. While Linux and Windows are the most common operating systems used in most servers, InterServer.net stands out from the crowd by using the CentOS system. This system is compatible with both Linux and Windows, but is resilient to hacking and spam. The hosting solutions of InterServer.net come in different packages, thus the varying prices. Each plan has a specific set of features that mostly address their clients’ needs. •	Web hosting. The web hosting package of InterServer.net begins at $4.95 per month. This is a cloud-based web hosting, and it includes unlimited domains, disk space, transfer rate, databases, emails, subdomains, FTP, and free setup fee. Its email access is compatible with smart phones, and can be installed as POP, IMAP, forwarders and auto-responders. •	VPS hosting. The cloud VPS hosting of InterServer.net starts at $6.00 per month. You can choose from different operating systems, such as Windows and Linux, too. Among the things that you can get from this package are 1 core CPU, VPS control panel, RAID 10 servers, DNS manager, fast IO, gigabit network, OpenVz or KV/M, cluster DNS, start-stop-reboot, and uptime monitoring. •	Quick Servers. The Quick Server package come with a 30-minute setup time, and has all the features found in VPS hosting. In addition, the Quick Server package comes with an Intel Core i7 CPU 960 at 3.20GHz, 8GB of RAM and HD space of 903GB. This package already costs $90 per month. •	Dedicated server. Dedicated server packages start at $49. Per month, and begins with Intel dual core Atom, 1GB memory, 250GB and hard drive. These days, InterServer.net is offering cloud web hosting packages for $0.01 a month for the first month, although it doesn’t provide free trial periods. While it proves to be a very good webhost solution, InterServer.net also has a few glitches. One drawback in this webhost is that it focuses straightforward on network uptime, speed and limited downtime, and not so much on the tools. While auto-install scripts can be found on cPanel, it may be more valuable for the hosting company to provide more tools that clients can immediately use to improve their sites. Unlike other web hosting companies, InterServer.net makes it a point to accommodate all of its customers. It has a customer support hotline that is up and available 24/7 via phone and chat. It also has a team of well-trained agents who are able to address and resolve the different issues clients call in, from network-based problems to upgrading account information, to making new service purchases. The good thing about the customer support services of InterServer.net is that clients from all walks of life are given the same satisfying treatment. There is no priority over premium clients and those who are using the cheapest plans; all their issues are taken notice of and given the appropriate action at the soonest possible time. InterServer.net is one of the best affordable web hosting solutions that you can find today. Indeed, there are many hosting companies that offer cheaper plans, but this proves to give the superb value for money. This is because InterServer.net keeps up with its word in terms of reliable network uptime, easy to use control panel and wide range of website building scripts. In other equally affordable services, the aforementioned features are often given with limited functions or as paid add-ons. InterServer.net is also highly recommended because its customer support team knows how to accommodate various types of client concerns. They know not only to resolve client problems, but as well ensure that they are being taken care of. In essence, if you want a hosting service that doesn’t give you a hard time in setting up and managing your site as it goes live, then InterServer.net is the best choice.